For many years, I revolved around painting, but also was involved in different art disciplines. I played in a band of electronic music and made movies at the Creative Film Workshops. I think this broad background is constantly vivid and helpful for me. As a painter, I started to engage in several online portals of art. For people like me, living far from big art centers, it is a good way of showing the work to a wider public. Of course, in this “art ocean” you can drown and completely disappear. That’s why I was taking part in competitions and gradually began to succeed. In the juried showcase contest organized in 2010 by ArtSlant.com, I got into the group of 10 international finalists from different disciplines of the visual arts. It was my “turning point.” I decided to dedicate myself entirely to painting; and soon, as a result of the “law of attraction,” I received proposals of collaboration from Polish, Austrian and US galleries. It’s hard to escape from the influence of the place where you live. In the East-Central part of Europe, where I live, we have a deeply encoded tradition of the essential representation of the figure in the painting: I mean the icons. The human figure is reduced there to his/her main psychological features. I think that such an old-time “iconic heritage” can be paradoxically regarded… as a good conceptual basis. I like this approach because representing a soul has a little to do with the topical and ordinary representation. So I avoid sketching every detail, also avoid redundant colors, minimizing and intensifying my creation as much as I can. My artistic research began with the idea of life conceived as an illusion, and the world as a kind of movie, in which different realities are mixed together. You can see through my paintings that the most important for me are the feelings, all these subtle connections between people. Of course, I am referring to my current emotions and thoughts, but also experiencing these captured in the works of art and pop culture – movies, books, music… So I play between realities. Art is a cutting edge activity, an important area of knowing myself. And probably the best part of me I can give to the others. Usually wake up about 7-8 am, then do some basic physical exercises. After breakfast, I drive or, in warmer weather, cycle to my studio. First checking emails, reading news I’m interested in. Next comes undefined 6-8 hours time, during which I make researching work: composing and recomposing ideas and finally painting. Because I spend so much time alone in the studio, I like to go out for meals and coffees. Sometimes I have evening meetings with my friends… and this is always uplifting and inspiring. Since my first step in painting is always conceptual work, it’s really hard to measure this in terms of time. But the very process of painting, for example, a medium sized canvas, takes for me usually two working days. I try to work regularly, even ignoring lack of “inspiration” or states of emotional hesitation to some degree. Coffee and music help me. And silent belief that it all matters. The social reality provides me with rich material. Especially deeply hidden emotions focusing my attention, all these intense stories regarding close related people. I think there are secret paths between artists of any kind. I like to attend concerts and visit exhibitions because it gives me a proper environment to develop my own creativity. But of course, not only the new phenomena in art could be inspiring. For instance, recently I listened to the Schubert’s piano sonatas and found in them fragments that touched me with its freshness. People usually find in my work their own emotions and thoughts. These are very uplifting reactions for me because I much care about “openness” of the structure in my paintings. Usually, I get emails with quite enthusiastic words. From the other hand, when sometimes someone is expressing a critical comment, I try to understand what he/she is really referring to. I’m an intuitive painter and instinctively use this sense at the initial stage of work. If some topic moves me I try to collect the stuff related, browsing my photo archives and also the internet resources. Then combine certain elements and reduce others – to highlight the main idea important for me. As a former graphic designer, I often use Photoshop for making “sketches,” and also a multimedia projector, which facilitates the transfer of the drawing to the canvas. Next comes the action of painting – the main battlefield. During this process happens that I go far away from the original concept. 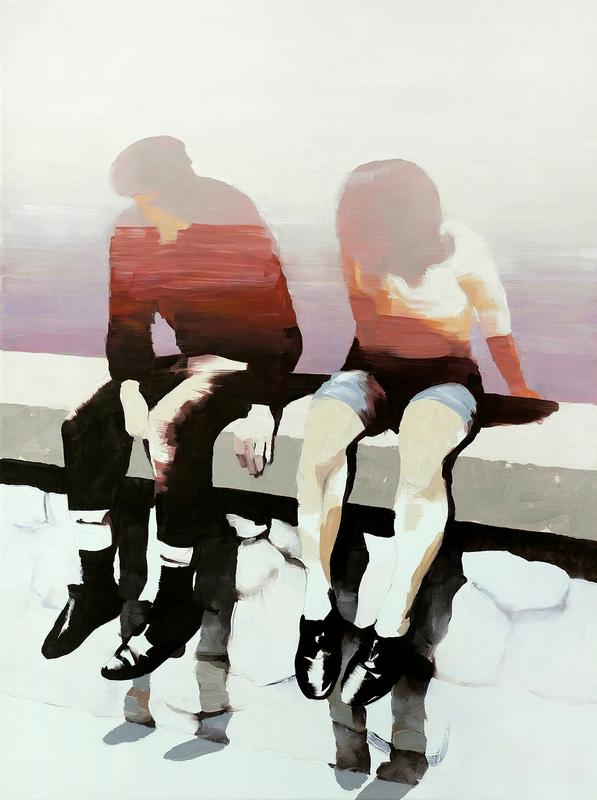 Check out more work from Jarek Puczel here.